You guys, this stuff smells amazing! 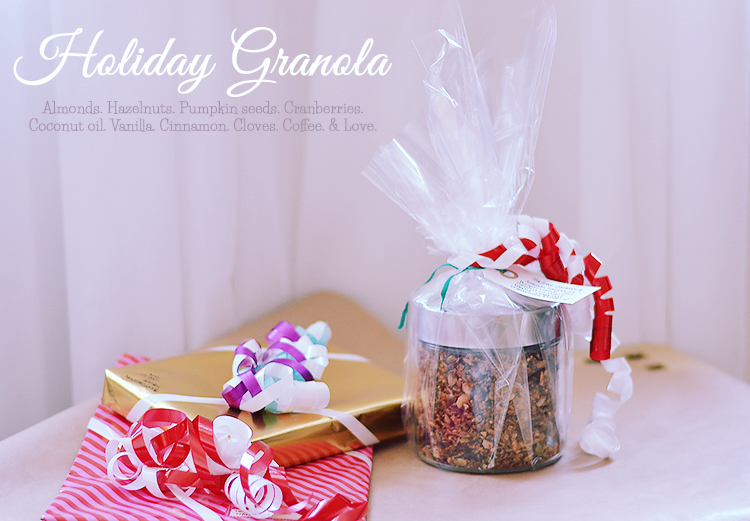 The combination of the coconut oil and spices (cinnamon, cloves, vanilla and coffee) create an irresistible scent, and in combination with the green pumpkin seeds and red cranberries this makes for a fabulously Christmas-y granola! Can you tell that I’m pleased with my latest invention? 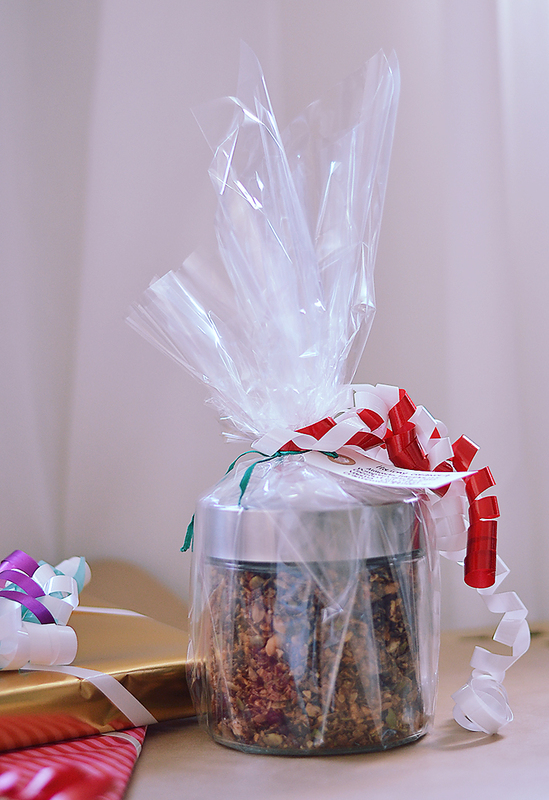 This was something I created for my mom for Christmas this year – with a bit of cellophane, a gift tag and ribbon it makes a beautiful gift, packed full of love. 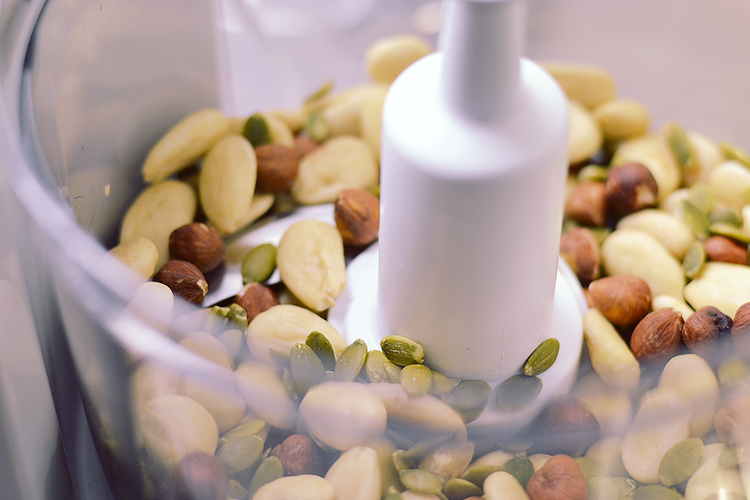 To start, I got a bag of organic almonds, hazelnuts and pumpkin seeds that I pulsed in the food processor to combine the trio and break the nuts into smaller pieces. Nuts are full of good fats and protein. Next, I added the oats and mixed to combine it all. 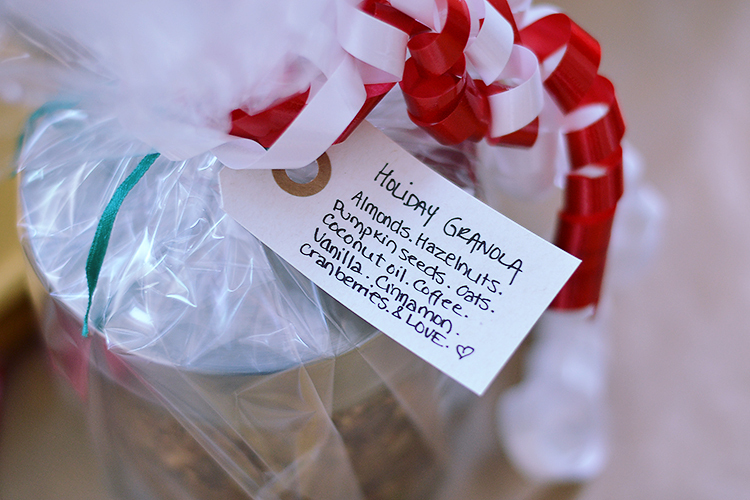 In a small bowl, I melted some organic coconut oil and mixed in my spices: cinnamon, ground cloves, vanilla extract, pure vanilla powder and coffee – Yes, coffee, this granola is an all-in-one breakfast. 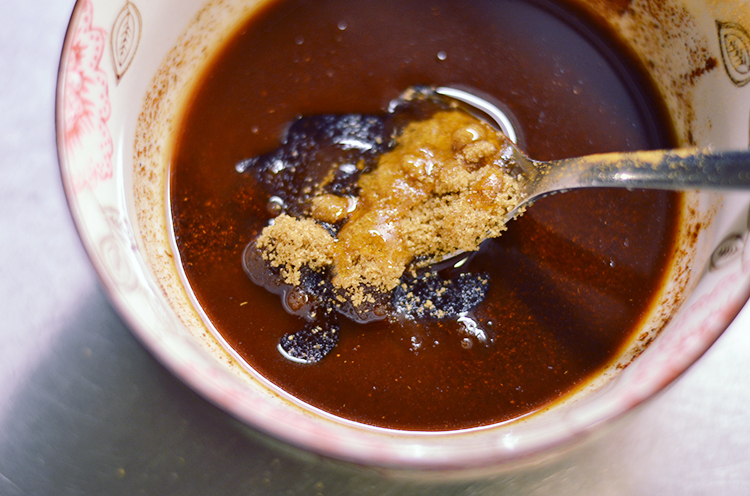 Then I added a touch of light brown muscovado sugar and syrup and mixed again. 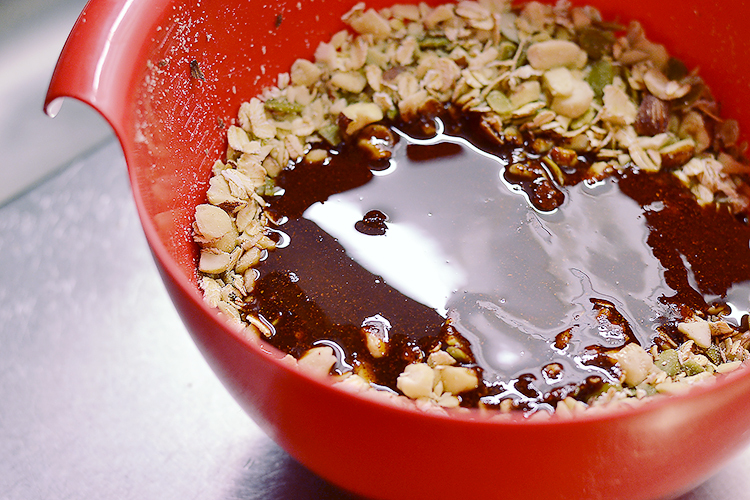 Pour the spice mix over the nuts and oats and mix until completely coated. 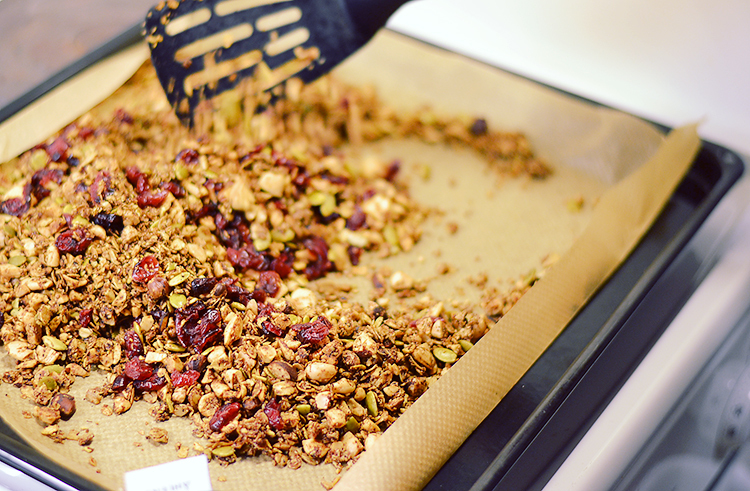 Pour the granola onto a baking sheet lined with parchment paper and spread out evenly. Bake in the oven for 10 minutes. 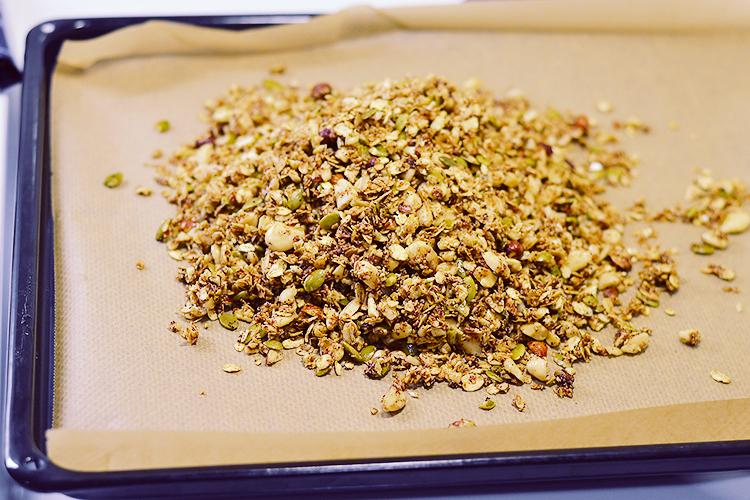 After 10 minutes in the oven, stir and flip the granola and then bake for another 10 minutes. Once finished baking, stir in the cranberries and then set aside to cool completely before transferring to an airtight container. 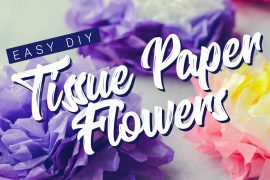 Wrap it all up nice and add a loving label. 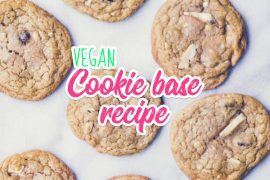 Preheat oven to 165 C / 325 F.
In a food processor, pulse the nuts and seeds until combined and any bigger nuts have been broken into slightly smaller pieces. 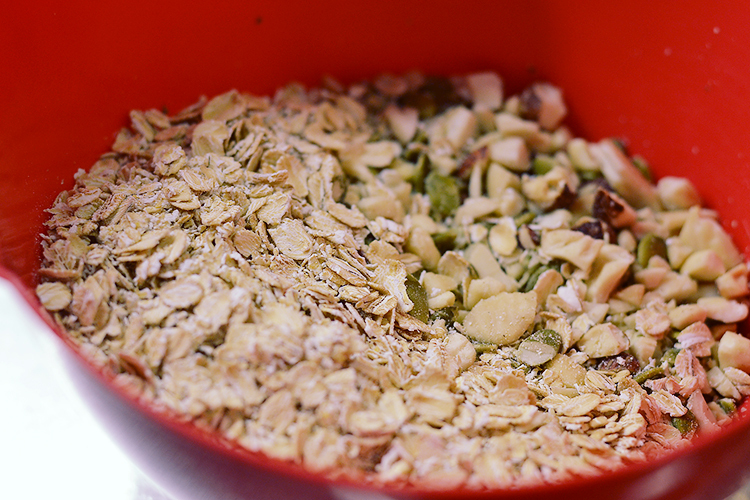 Transfer the nuts to a large bowl, and add the oats. Mix until combined. In a small bowl, melt the coconut oil in a hot water bath, then add the spices and stir until completely combined. Add the sugar and syrup to the coconut oil and spice mix and stir until combined. Pour the coconut oil, spice and sugar mix over the nuts and oats and stir until everything is coated. Add a pinch of salt and stir again. 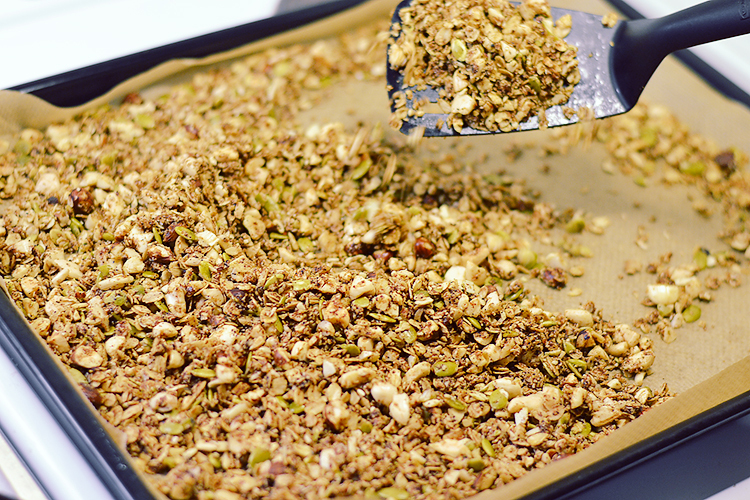 Line a baking sheet with parchment paper and pour the granola onto it, spread it out evenly on the baking sheet. Bake on the middle rack in the oven for 10 minutes, then stir and flip the granola and bake for another 10 minutes in the upper third part of the oven. Once baked (lightly browned and slightly crunchy), mix in the cranberries. 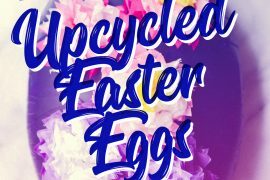 Then set aside to cool completely before transferring to an airtight container.